WATERVILLE – HealthReach Community Health Centers, a nonprofit committed to providing high quality, affordable, patient-centered healthcare in the medically underserved communities of Central and Western Maine, has been selected as a beneficiary of the Hannaford Helps Reusable Bag Program for the month of May. This exciting program has been designed to support local nonprofits like HealthReach Community Health Centers. For every blue Hannaford Helps Reusable Bag with the good karma messaging purchased at the 190 JFK Plaza Hannaford in Waterville, HealthReach Community Health Centers will receive a $1 donation in order to help fulfill its mission of providing high quality, affordable, patient-centered healthcare in the medically underserved communities of Central and Western Maine. Learn more about HealthReach Community Health Centers by calling 1-800-299-2460 or visiting www.HealthReachCHC.org. 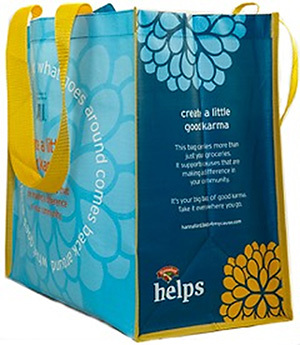 For more information on the Hannaford Helps Reusable Bag Program, visit www.hannaford.bags4mycause.com or facebook.com/hhbagprogram. HealthReach Community Health Centers is a system of eleven federally qualified health centers in Central and Western Maine. Dedicated providers deliver high quality health care to citizens in over 80 rural communities. To ensure access for everyone, HealthReach accepts Medicare, MaineCare and major insurances. In addition, we offer an Affordable Care Program to uninsured and underinsured residents and assist with applications for other programs that help with the cost of health care and medications including the Health Insurance Marketplace. A private, non-profit with a 41-year history, HealthReach is funded by patient fees, grants and individual donations.